Every two years, Starbucks hosts a conference discussing their business with investors, and fielding questions from analysts. 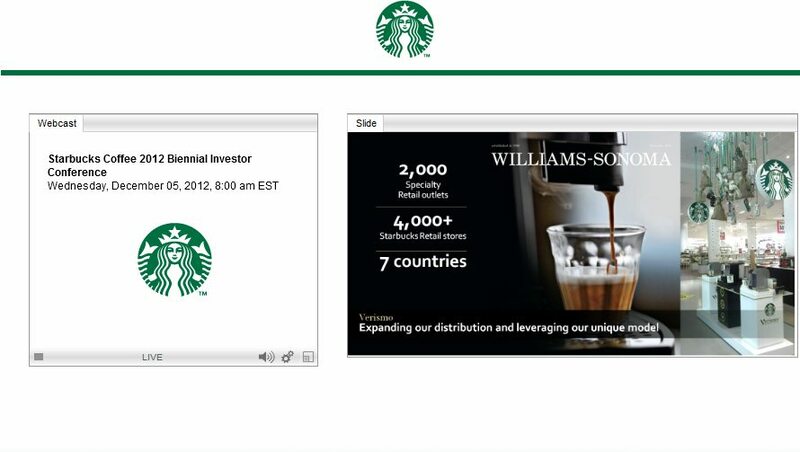 Anyone can stream this via the Starbucks investor relations page. The conference lasts roughly six hours. I didn’t listen to the whole thing, but I wanted to throw out a few highlights from what I heard this morning, streaming this conference. 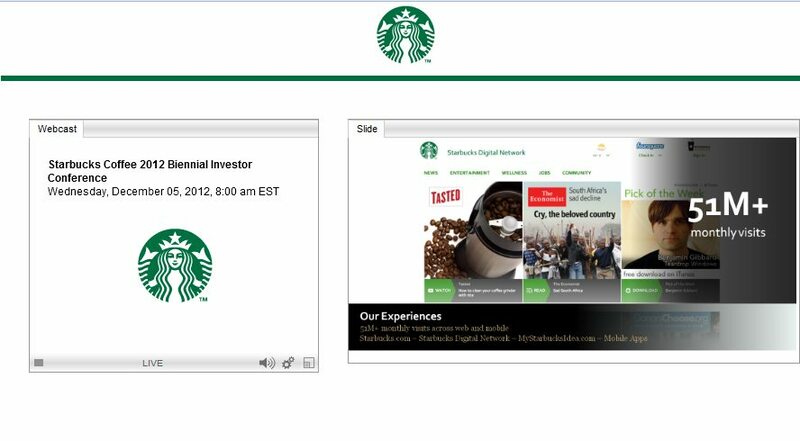 Of course, senior officers at Starbucks (Howard Schultz, Cliff Burrows, Adam Brotman, Jeff Hansberry, Michelle Gass, and more) lead presentations speaking to highlights of what’s happening in their specific areas of the business. Congratulations Chad Moore on your store’s great success! Via is a $300 million business already! Someday, the CPG business will be the size of the retail business. Starbucks plans 1,500 net new stores in the United States over the next five years. Cliff Burrows said that in the spring, Starbucks [in the United States] will be putting names on cups, and barista names on aprons. This will strengthen the emotional connection with the customer. 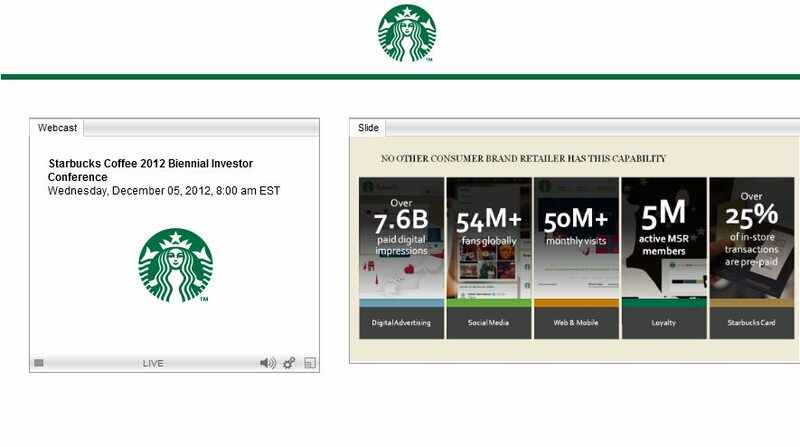 Evolution Fresh will be in more than 5,000 U.S. Starbucks stores by the end of 2013. Starbucks has been experimenting with their “Evenings” stores which offer beer and wine, and an elevated food menu. It’s in 15 stores, and the results are encouraging. Food at Starbucks accounts for 1.5 billion dollars, but only one in three customers are buying food with their beverage. A lot of room for opportunity. Partner engagement is key. 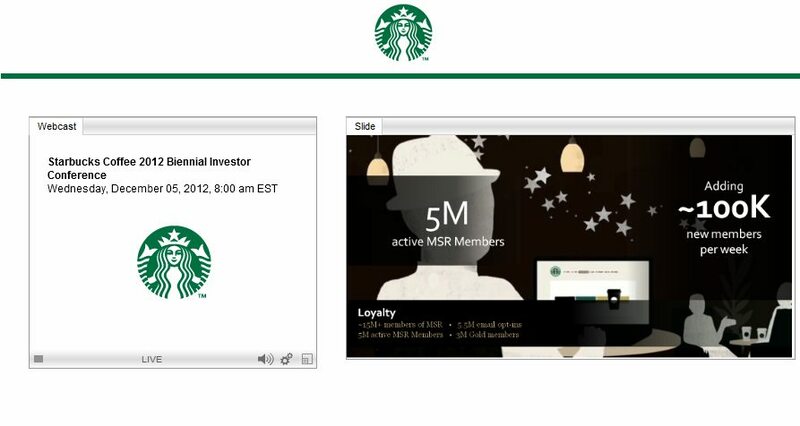 At Starbucks stores, more than 66% of stores have had their store manager in it for more than one year. During the Q & A session, Cliff fielded a question that related to CPG diluting the brand. He talked about keeping the integrity of the brand, and not degrading it. I loved this Cliff-quote: “The customer has the relationship with brand and we have to keep putting deposits into that reservoir of trust.” #CliffForTheWin. Adam Brotman, Chief Digital Officer, covered all things digital. 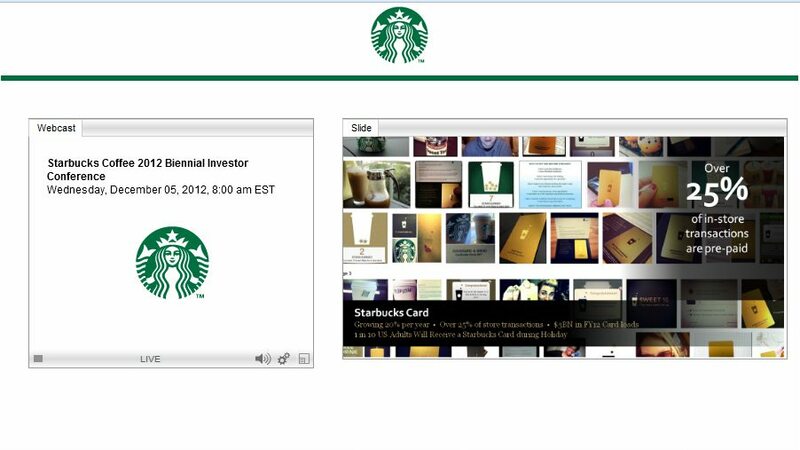 There are more than 300,000 registered users on MyStarbucksIdea.com, and over 54 million Starbucks Facebook fans, and over 3 million Twitter followers. There are over one million followers on instagram. 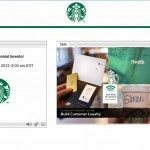 There are over 15 million MyStarbucksRewards loyalty members, with about 5 million of them opted into to direct communications from Starbucks. Three million customers have earned their way to the gold level. By the way, at several points Adam mentioned being able to use purchase data from the Starbucks card purchases to be highly targeted, and predictive with models. 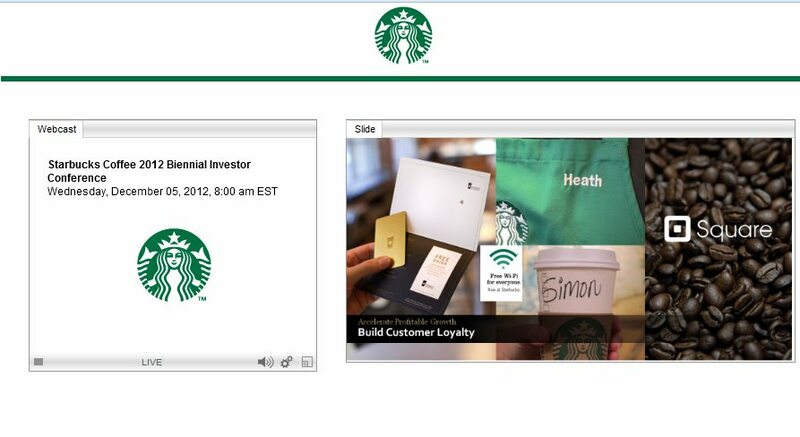 And there is a great opportunity for Starbucks to communicate directly with customers through this platform. This reduces reliance on traditional paid advertising. Dollar reloads on Starbucks card is growing at 20% a year. There are about 2.1 million mobile payments a week, which has the positive effect on speeding the line. 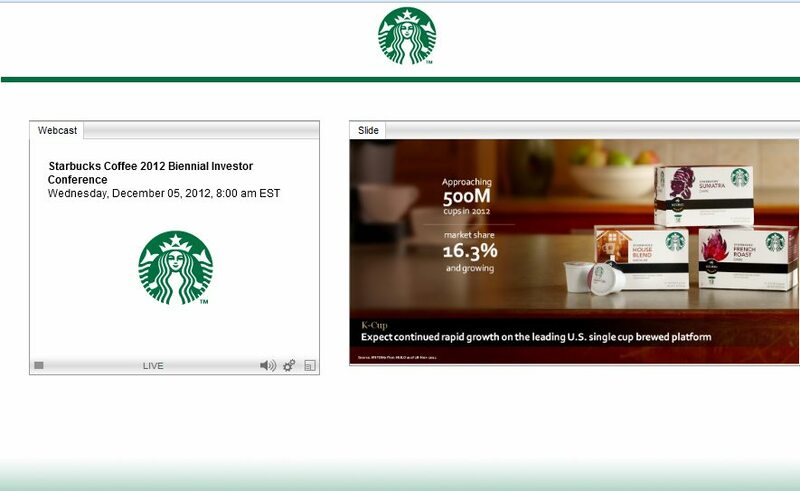 The CPG category is the second largest business unit at Starbucks, and a 1.3 billion dollar business at Starbucks. Via Ready Brew is now nearly 300,000 million dollar business across 14 countries, and Starbucks continues to innovate with new flavors. 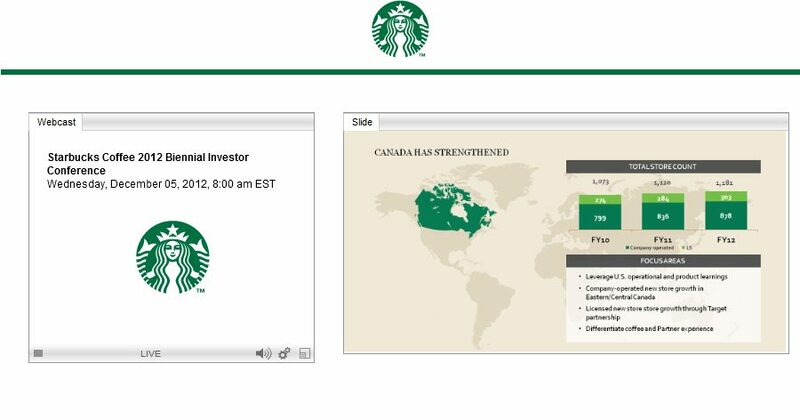 In 2012, Starbucks grew the via business by 45%. Customer adoption of the K-Cups has been strong. In the first 11 months, Starbucks has sold over five million cups, and now has a 16.3% market share. Starbucks has been testing the “Starbucks Signature aisles” in the grocery stores. Stores that have been testing it, have seen a two to three times sales lift, and it will be rolled out to several hundred in 2013. This conference is very long! I listened to about the first 3 hours (from 5am PST to about 8am PST), and quickly threw together these highlights before running out the door to work. Lots of interesting things to think about. I may later go back and add a few more highlights, if I have time this evening. I still would like to add in a few more of Jeff’s highlights, and add in some of Michelle’s section of the conference. Starbucks to introduce a $450 steel card. Melody thanks for putting this blog post together. So many interesting things. There were certain comments that stood out for me. One is that the partners will begin to wear name tags. I know this has been an issue before with some liking it and others not so. I get to know the partners by name as I think it is important as they get to know me by name, but it is nice to finally be able to say hi to partner by name. Also, I like the fact that more stores will be opening up especially Evolution Fresh and the Evenings stores. I hope the stores they open will not be in one region but all over. I also hope perhaps with their comments about the food issue that they expand to try to offer food to those of us that are not eating the standard fare, etc. Also, enjoy looking forward to seeing how they expand the tea line and the Teavanna stores. And lastly it seems like they are still saying the customer is number one. I like hearing that and hope this mantra will more effectively filter down to stores because sometimes it is hit or miss depending on the store and its partners. Thanks for summing things up for us. What stuck out to me is the fact that they are FINALLY going to have employees wear name tags. FINALLY, I can address the barista by his/her first name. Given, I do know Michelle from my local SB but I don’t know the guy at the window in the next town over. They know my name when I give them my order but I like to know theirs too. I always wondered why they didn’t have name tags. It is interesting how there is so much puffery by Howard and Starbucks (they do have a way of talking about things, don’t they? ), but also how closely they continue to be aligned with elements put together during the “transformation agenda” era. Back then they talked about growing the CPG business and look at it today. Melody, thanks for this post. As a couple of the above posters mentioned, I think it is significant that Starbucks is finally going to out the Baristas’ names on their aprons. I have always had trouble remembering names and now I have the additional senior moments 😉 . As has been shown on MSI, Starbucks is going to get some complaints about names on the cups, like their name on a cup and it being called out is an invasion of privacy. The Baristas are going to have to watch out for the Bart Simpson types who will use name like “I. P. Freely”. I sure hope that Starbucks does not ruin Teavana. When my Daughter visited a Teavana Store in Dallas she was impressed with the knowledge and customer skills exhibited by the employees. Tea drinkers are much like those of us who enjoy the finer coffees, so a frappuccino attitude will not be welcome. IMHO, Starbucks could do very well if they would return to a central coffee focus instead of trying to be everything but. BTW, why no mention of what is happening with the San Francisco bakery deal (sorry, the name escapes me at the moment). And no, I am not staying at home today waiting for my Verismo, the water heater died this morning and I am waiting for the plumber. @CD – I agree there is some puffery in the language that Starbucks executives use. When I’m trying to synthesize a voluminous amount of information from these kind of thing, I can’t do much with “maniacally focused” and other watchwords that Starbucks executives always have ready to throw out. It’s easier to zoom in on specifics: Names on aprons in Spring 2013. 1500 net new stores in the US over the next 5 years. @DadCooks – I actually think that the majority of Starbucks customers will be fine with names on cups. There isn’t going to be a strategy that makes every customer happy. I think the best case scenario is simply making most customers happy – and many do like a name on a cup – partly as to get the right beverage to the right person, and partly for the connection, or for whatever other reason. As to Teavana, the message I took away from what I heard of this conference call is that Starbucks is essentially going to start R & D on beverages made with Teavana products – and it did not seem to suggest that the existing store base would change a lot, but we’ll just have to see. There was a segment on La Boulange bakery. I was lost listening to it. By piecing together information from the Q & A, and from what others said, it sounds like part of the idea would be to have more frozen items in stores that are baked right there on the spot – like the University Village test in one of my much earlier blog articles. This would seem to suggest that stores will eventually be fitted with freezers. Pascal, the original proprietor of La Boulange, speaks with a French accent, and he was a little harder to understand. I only had a limited amount of time to pretty much THROW together what you see above before running out the door to work. I skipped writing about La Boulange because I need to carefully parse out what was said about it, and re-listen to Pascal. In the interest of time efficiency this morning, I pretty much zoomed in on what I could quickly put together. And above are highlights from the first 3 hours of the conference. I may still put some more work into it and listen more, but it’s a lot of time to sit and listen. Glad to see the many thoughtful comments. One of the highlights of the Houston conference for me was getting the chance to speak to Pascal. He was there and wandering around in the Leader’s Lab, and the way he spoke about food was the way we speak about coffee. And yes, the long term idea was that all stores would have freezers and our ovens be retrofitted so that at any time of the day, you’d only be like, 90 seconds away from any pastry item you wanted as we could defrost individual servings. And here in BC, we’ve been doing names on cups for almost a year, and wearing name tags since the beginning of the summer. I love names on cups – it has simplified a lot of things, and has been a great connecting point with customers. And if a customer is uncomfortable with it, we make a name for them – Tom Cruise comes in a lot :), for example, and we have one customer who likes to pick a different Disney villain as their Starbucks alias. Name tags I’m a harder sell on – I do have one or two customers who make me uncomfortable with the use of my name, but I’m the SM, they could’ve found it out easily enough anyways, it just takes away one of the barriers. My main problem with name tags is that we are using a chalkboard style name tag, and they don’t look good for very long – they get wet and smudged, and I get tired of sending my team to the back to fix them up again. But other than that, it has been good – there has been a lot more use of our names by customers in a good way, mainly because they don’t have I ask every time and get embarrassed when they don’t remember. And the ‘bucks definitely has a language. My family comments on it all the time – there are little words and phrases I use that I never did before working there – they call it Starbuck-ese. as usual, agree with @DadC….I wish so badly Sbux would get back to “a central coffee focus instead of trying to be everything but.” seems like I’ve been saying that more and more. and the only 1 in 3 customers buying food statement? maybe that’s because of so many frappucinos, which, imo, are not as likely to have food with them, as is a cup of coffee….like the old days. re: the name tags..or, names sewn on aprons…which is what we’ve seen around here for quite a few mnths (at least many of the stores that I go to)…..I’ve never really cared so much either way. I know the name of the partners in the places I go most often, and they know mine. I don’t care so much about the places I rarely go. I don’t think it has anything to do with the customer connection. I’m more likely (in a ‘nameless’ store) to remember a perfectly made drink, w/out having to explain it, than whether or not that partner was wearing his/her name. (remember the partner, due to that experience, I mean)….or just overall, how they served me? That’s what I find important and forms those connections…or, at least forms the ‘building blocks” of those connections. I don’t care about the names on their aprons. also, names on cups: apparently they’re not happening as universally as one might be led to believe from comments on MSI! As I’ve written before, that’s something that as I grew (old-er) with Sbux, was not done in the Chicago area. I still see it nowhere here. And, so far, it’s worked out ok. This kind of, to me, is just another attempt at those ‘connections’ and I’d say the same thing about my name on the cup as I did about the names of partners aprons. @CD: same as you said, too! @denise r’s comment reminded me about something the manager at my regular Starbucks told me and I have put 2 and 2 together. Next year customers will be able to comment at any time, using the Starbucks App (no word on what the App-less will do 😉 ). Having the names on the aprons would facilitate commenting on specific partners. You don’t leave your StarWorks planner out in the open like all the stores around me do you? >>Name tags I’m a harder sell on – I do have one or two customers who make me uncomfortable with the use of my name, but I’m the SM, they could’ve found it out easily enough anyways, it just takes away one of the barriers. The whole name on cups thing threw me for a loop when I first heard it. We’ve been doing names on cups in Cali, at least my LA area, for about 6 years now. I wasn’t aware it WASN’T a standard. I realize not everyone did it, but most of the stores I worked at / visited for coffee were taking names. We’ve even gotten to a point to teach new partners that its okay to just say “Bob your drinks ready!” instead of “Bob we have your Venti Mocha with 3 shots, soy, decaf, bla bla bla” it makes things more personal and it is easier/quicker for the barista. @Karl – um, no, I don’t? Hangs out in my locked backroom. Or my car depending on how organized I am that day… Doesn’t actually have my name in it anyways, come to think of it. But, my business cards that are out front do. All my regulars know my name, and well, I’m there often enough and have a ‘commanding presence? ?’ haha, so I’m feeling like, nametag or no, someone can find out my name in about 3 minutes flat. And Chase, I agree, when I heard about names on cups at the conference, I had to remember that not everyone had been coaching it for almost an entire year. It’s odd…from what I’ve been reading for the past couple yrs on msi, you’d think ‘names on cups’ had been standard practice EVERYWHERE except the Chicago area. Those were the rxns I got when I posted: never seen a name on a cup in the Chicago area in my 20+yrs of going to Sbux. Apparently the names on cups was not as nation-wide as the remarks made it sound. @Barb – Long time no see! Good to see you! Well, if any Starbucks do magically appear in your area of France, please do send me pics for the blog! Where’s the closest Starbucks to you? Paris? As the mother of a Starbucks partner, I hope they don’t require they put their real name on the apron, if they wish not to. I’ve heard enough stories about odd-behaving customers – I’d rather they not have more personal information about my daughter. Customers can give any name they want. I’m a bit torn about the names on the aprons, but as Rebecca said, my customers all know who I am anyway. There are customers who know me by name who I run into in other areas of the city and I’m at a loss because I can’t remember who they are! (Sometimes it’s a drink and face combo that brings the name to memory) It’s the young female baristas I worry about (which is most of my team right now), it’s a lot easier to avoid a creepy person if you can remain anonymous than if your name is out there for everyone to see. Plus, honestly, I feel like if I can remember hundreds of customers by name and drink that they should be able to remember our names without a nametag.